The theme for this month's Reverse Confetti Stock Your Stash challenge is baby cards. I don't have any of RC's baby themed stamp sets, so I improvised a little with the whale image from the Seaside stamp set. 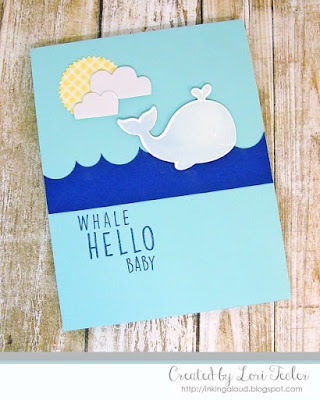 I stamped the whale in a super pale blue pigment ink, then cut it out with the matching die. I used foam tape to adhere it over a strip of RC's Navy cardstock with a wave-like pattern along the top, courtesy of snips made with circle punches, that I'd attached to an Iced Aqua card base. To fill in the scene, I added a yellow gingham pinking edged sun and a pair of shimmery white clouds, cut with dies from the Honey Bear die set. For the sentiment, I got creative and combined stamps from the Seaside and Whole Lotta Happy sets to come up with the "whale hello baby" sentiment. It was stamped in navy ink just beneath the wavy navy cardstock strip. This is so adorable Lori!